For any woodworker, a workshop should be an oasis of creativity; however, it can become a dangerous torture chamber with even the smallest mistake. It’s easy for something to go wrong due to machinery complications, human error or a mixture of the two. Whether you’ve found yourself here as a preventative measure or as a last resort, it’s never too late to learn good first aid. It’s tempting to panic immediately after hurting yourself, whether it is a serious injury or a minor one, however yelling expletives and hyperventilating aren’t going to make it better. Take the time to sit and take deep breaths. If you’re breathing quickly, that will put excess strain on your body and may make it more difficult to treat your wounds. One way to reduce the stress of treating your own wounds is asking someone for help. This depends on the type of injury, but generally the first thing to do is to apply pressure directly to the wound with something that can soak up excess blood (gauze, paper towels, or a clean rag). It’s smart to keep something like this in your immediate reach in your workshop, rather than storing it away. Hold the cloth or paper to the injury until the blood flow has lessened and will not bleed through a dressing. Generally, the best way to clean a wound is with soap and water. Be careful to remove any debris or foreign objects from the wound without damaging your skin, if possible. Antibiotic ointment can be applied after cleaning the wound, however, too much ointment may soften the scabbing, so only apply lightly. Avoid more abrasive cleaners, such as hydrogen peroxide or rubbing alcohol, as they can stress or damage tissues. It’s necessary to cover any injuries to protect them from infection from outside irritants. Bandage your injury and check it regularly, changing it when it becomes wet or dirty. When changing the bandage, look for any signs of infection, such as increased sensitivity, pain, or swelling. If you suspect an infection, contact a doctor immediately for treatment. Failure to treat an infection can lead to serious complications down the road. If a cut is spurting blood, you may have sliced an artery, so you’ll need to seek medical attention immediately. For cuts bleeding at a normal rate, be sure to apply pressure to the cut, clean it and cover it with a bandage suited to the type of injury. Adhesive bandages work well for a variety of cuts, so it’s a good idea to keep many sizes and shapes in your First Aid Kit. For larger cuts, gauze pads or rolls of gauze are helpful for soaking up blood and covering more surface area than a standard Band-Aid. Steri-Strips, or Wound Closure Strips, keep wounds closed temporarily until they can be properly treated. In emergencies, many woodworkers cite the use of Super Glue, or C. A. Glue, to hold a cut closed. While this is certainly not the most sanitary option, it can be used in a pinch. Treatment of a splinter usually requires a pair of tweezers. Do your best to remove all splinters, but don’t be overzealous with the tweezers or you may cause further damage to your skin. Clean the tweezers before and after pricking your skin, because using dirty tools to clean or treat an injury will increase the likelihood of infection. If the wound is a larger puncture and you cannot remove it without possible damage, keep the object where it is and seek immediate medical attention. Be sure to receive a new tetanus shot if you are punctured by metal and have not received a tetanus shot within the past five years. Immediately after any kind of amputation, wrap the wound and apply pressure to stop the bleeding. If you’re able to locate the amputated part, put it in a Ziploc bag with a cold pack from the freezer, not ice. Don’t put it in direct contact with ice, as it will increase the chance of hypothermia, destroying the tissues of the amputated part. Use a tourniquet to cut off circulation from the amputated stump and seek immediate medical attention. Your work is important, but so are your limbs. Moving too quickly or carelessly in a workshop can lead to serious injuries, so take the time to plan out the work you do each day and do it right the first time. Don’t take the easy way out and risk your safety. If something seems wrong, it probably is, so don’t do it. 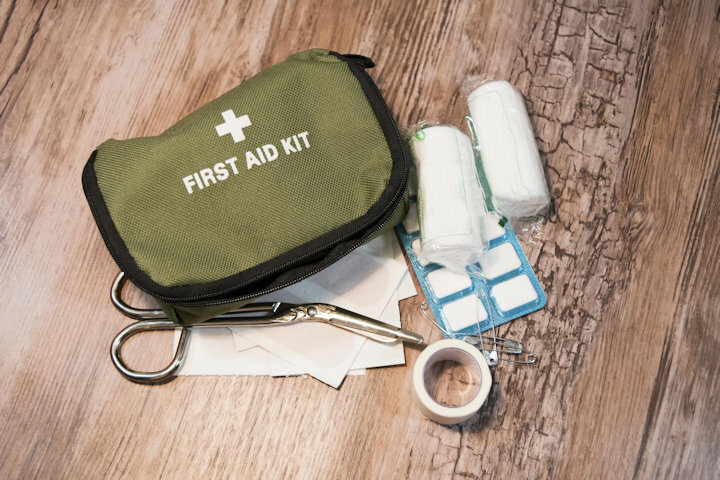 Before working, look in your first aid kit to see if it is stocked with what you might need in the event of an accident. That way, you know where the kit is and whether or not it is fully stocked in case of an emergency. If you’ve injured yourself, don’t just bandage it up and continue working. Take a moment to assess the damage, and when in doubt, seek medical attention. Great article, but with any bleeding that is spurting blood it is essential and life saving to not only apply direct pressure but to apply pressure over the closes artery or pulse point, for example if hand is lacerated by saw blade, etc, apply pressure over the radial artery, (where the nurse checks your pulse), or if an arm injury apply pressure to brachial artery on the inside of upper arm, (side of bicep muscle). Having worked in the ER for 35+ years we often see these types of injuries in woodworkers and printers also. Firstly, if you havent attended a First Aid Course, then you should. The most frequent people you will treat are yourself, workmates, family and friends. It is not that common to treat people you do not know… A page like this does not take the place of doing a course. The immediate treatment for a wound with severe bleeding is direct pressure and elevation. If that doesn’t work then indirect pressure. If you put a dressing on the wound (not cotton wool) and it bleeds through then put another dressing on top. Use only clean water to wash a wound, not soap. If you use soap then carefully wash around the wound but not the wound itself. If the wound requires a bandage it probably should receive medical attention. Ointments are second aid, not first aid. If you need medical attention, what you put on a would can effect what the Dr can put on it. Often antibiotic/antiseptic creams in a first aid kit are not sterile – either opened previously or are out of date, when did you last check? Veins bleed as much as an artery! Just because the wound is not spurting doesn’t mean its not serious. A huge consideration in treating serious wounds is a condition called SHOCK. With a serious injury treat the patient where they are, bring the first aid kit to them. attend a first aid course to learn more. Source: Outdoor (Wilderness) First Aid Instructor for over 20 years. These guidelines are ok in general. 1) INSTRUCTION: Decide, as early as possible, if you are going to seek medical assistance or not. A rule of thumb, is whether or not you can see “something” under the lacerated skin; if “YES” then have a doc look at it. You also need medical assessment if there is evidence of fracture, if a penetrating wound is too deep for its surface, and if any “unusual” injuries are present. Once a guy tried the compressed air spray varnish on his palm to see if it was blocked. It made a minute hole in the skin of his palm, and finally the hand was very badly injured because plenty of varnish was injected this way under the skin and all along the tendons and muscles. Keep in mind: seeking medical attention may take long hours, and finally prove unnecessary, but peace of mind is worth a lot. IF YES (seek medical attention), then pack the wound as tight as possible and get someone with you to take you to the hospital/doctor/nurse wherever that is. There are specific things to do if it is a long travel to there. A list of telephone numbers may prove VERY helpful. Let them know you are coming if things are serious. IF NO (medical attention needed), clean the wound and dress it; the comment johno made re. a course or seminar, is of fundamental importance. If you decide to look after the wound yourself, it is wise to have someone experienced (at least a nurse) to look at it in 24 – 48hrs. 1)DATE LABEL OUTSIDE THE BOX. Note when you set the box up. It is beyond imagination the amount of time that passes unnoticed and when you suddenly open the box and need something in it, everything has expired / rotted / rusted. At least once a year open, check, update MATERIAL AND DATE LABEL. 2) BANDAGE SCISSORS: the facility here does not let me publish a photo to show you that there are savior scissors that will cut through clothes easily, and frustratingly useless scissors that have been glorified since world war 1. It is mandatory that you can cut quickly through clothes to isolate the injury and bandage it. 3) STERILE DISPOSABLE BANDAGES, MORE THAN ONE. It is common place to drop a bandage on the floor when in rush and thus render it useless exactly the moment it is needed. 4) CREPE BANDAGES, at least a dozen, several widths, 2 – 3 for each. You will have to bandage the limb and strap it. 5) STERILE GLOVES, 2 – 3 PAIRS: If the victim is not you, you are happy and honored to help, but bathing in the victim’s blood helps neither you nor the victim. Also, a sterile glove is a very neat envelope to drop in the amputated finger for transport. 6) MOST IMPORTANT, THE ACTUAL THING TO PUT ON THE RAW SURFACE OF THE INJURY: Start from band-aids, go up to the military-type sterile bandages, if you can find them. Always have more than one, and always keep an eye on the sterilization date. 7)STAY AWAY FROM MODERN SHINY GADGETS, ANTIBIOTIC SPRAYS AND OTHER NOVELTIES. Washing a wound requires training that is beyond the scope of your workshop first aid box. A generally acceptable sterilising losution is betadine, but the authorities in your area may have a policy with a different agent. Ask them in advance, we are long past the days of rum. 8) DO NOT PLAY GOD, RAMBO, TARZAN ETC. We are finishing the second decade of the 21st century. 9) THINK: TIREDNESS, HURRY, AND DISTRACTION are the factors that will guide your finger into the tool; (not to mention alcohol and smoking, work under medication, and sentimental load). Featherboards and fences are only auxiliary measures.